I think that sometimes I have been grateful for machines and I realise their real value when woods have difficult grain. I remember one time passing a most beautiful treasure of mesquite burl into my planer for a second pass of 1/64th. Not a heavy cut at all. The first pass had worked fine and I was passing it through oriented the same way as previously. The piece entered fine and then suddenly exploded every bit of it somewhere into the cutterhead. Nothing came out the other side and 16″ by 5” wide of 1/2” mesquite burl that should have made a perfectly book matched lid was obliterated. That’s not so rare an occurrence as it might seem and that’s why many users of thinner stock use planes and scrapers rather then machine planers to thickness their stock down to final sizing. I know that many guitar makers use thickness sanders to gain the thickness to exactness but I also know that Marty Macica resolves his work as I do using hand methods and no sanding. This is because he feels the sanding dust fills the grain pores with dust that deadens sound. Marty is teaching a new guitar-making workshop later this year in New York and you can see him do that here. Resuming from my blog a couple of days ago here. My mesquite pile had now ceased to lose weight. In summertime Hill Country Texas that means it’s as dry as you will get it and that’s when I like to start putting my final thoughts on paper. The most economical way to use rarer woods is to create veneers from them. Our modern take on that is of course that veneers are somehow cheating us out of the real thing and to some degree that’s quite true. IKEA and others use thin veneers to mask what’s underneath and they might tell us it’s to save the rain forests, which of course is untrue. Most modern goods with surface veneers are usually super thin. So thin in fact you can see through them to the light sub-woods underneath. What mass makers want is something that feels and looks like real wood for its warmth and appearance and at the same time controllability to pass it through machines for tight tolerances. Adding stain to equalize colour and tone gives them and us the illusion of real and we unwittingly buy into a built-in obsolescence product. This is less true of hand crafting artisans who want the control MDF offers, but creative ways of using veneers. Box makers often use this and I recall the most prodigious UK furniture makers SilverLining making doors for the Russian Embassy in London using MDF for some massive doors that were veneered with some very special veneering to the faces. Many top-notch makers use MDF. I chose ot to do this and find ways of veneering with solid wood as a substrate. It can be done but it takes careful consideration every time. The piece I designed had many features I chose from my early signature details. The rails separating the drawers comprised hidden aspects to the internal joinery but through tenons cross-wedged on the outside. I have always liked this feature because it visibly shows the contained tenon within the mortise and the compression within that creates a lock to the dovetailed tenon. Inside the tenoned area I created a housing 3/32” deep. I wanted to support the rear of the rail. In the scheme of things all joinery necessitates one part to to be reduced in some measure to fit into another. 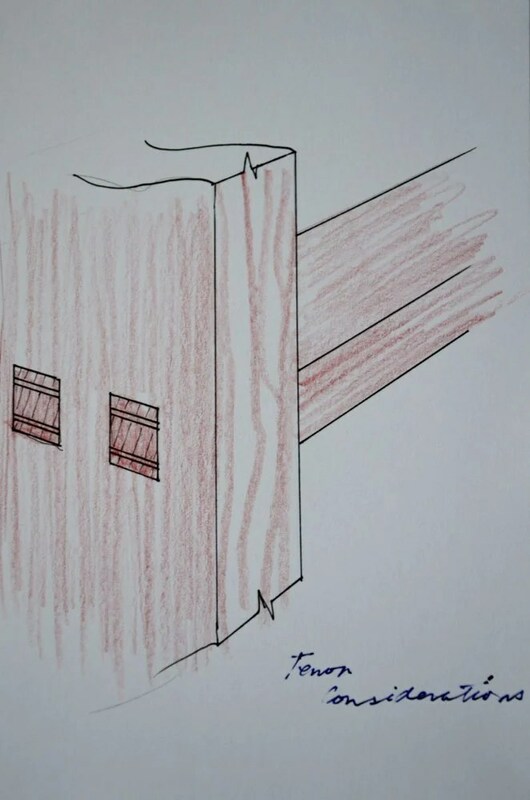 I considered two types of mortise and tenon joints and chose one for different reasons. Here are the two options I thought to consider. The one on the left is a single through tenon. The one to the right is a twin tenon. I rejected this for this particular piece but used it in other work later. I felt that the joint with twin mortices took too much wood way. It made the joint area weaker, but I decided this based on my knowledge of mesquite and knowing it’s brittle nature. using a single tenon meant I could move the tenon further from the front edge of the side panel and increase the strength that way. 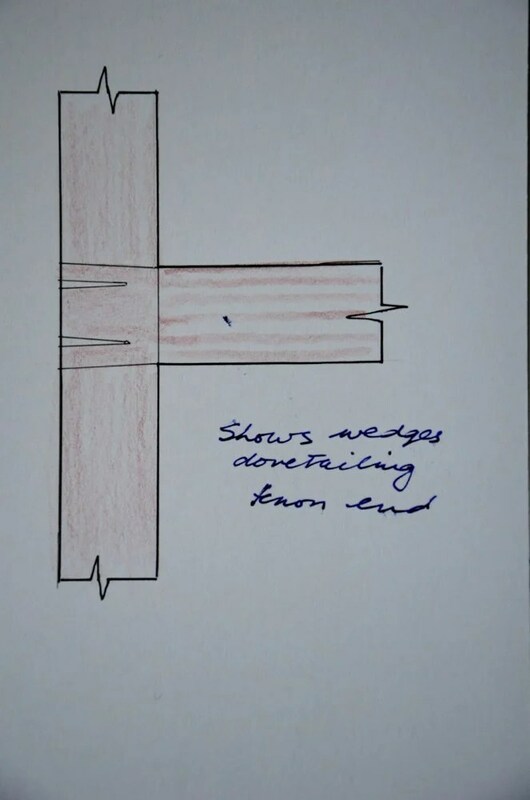 The cross wedging needs much care too because the wood either side of the wedge needs to retain continuity along the length of the rail. The wedges are not too long and must not be driven into the rail beyond the depth of the saw kerf. I start my wedge the same width as the kerf, that way the the wedge immediately parts the narrow section of the wedge to press it into the widened aspect of the mortise. I forgot to tell you that the outer aspect of the mortise to the top and bottom are widened with a sharp chisel. You can see this in the drawing. It’s always important to consider joinery in terms of its reductive parts. Widening a tenon means less wood surrounding the mortise. Reduce the size of the tenon too much and you have a weaker tendon. Reduce it too much and you destroy the efficacy of the tenon in favour of the mortise. Joinery is about finding balance and seeking harmony between two married parts. Each relies on the other, which is why when I was young the men always referred to “marrying” the various parts. It’s a reductive process you see, but one part cannot be reduced so much as to be weaker at the cost of the other. This is a wonderful series! It is helpful to see the full cycle of the design process and learn from a real example. Your drawings more than make up for photos. Thank you. When you design, do you work out gross things first like the overall proportions, drawer numbers and sizes and so forth, and then come back later and work out ornamentation like mouldings and veneering, or is it not so linear? 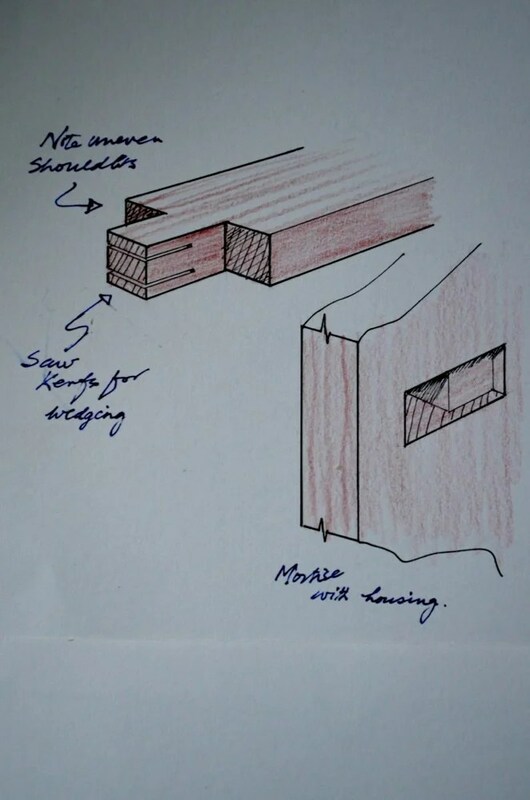 Here, it seems you’ve got your proportions drawn, some key ideas like the alternating drawer pattern, and you’re bringing the key joinery into the visual picture as you work through how the wood constrains what can be done and how you want to implement it. Is the rest of the ornamentation (knobs, mouldings, edge treatments, scrolls, etc.) minimal to highlight these features, or it is worked out later and just not drawn yet? Good thing that stock came apart on the planer rather than on the jointer! I doubt whether I would have jointed it by machine. It was a risk and I was the loser. More on your questions in the next blog. by the way. Would love to see more details on the runners and kickers etc for lasting drawer pocket construction, it’s of interest to me to see how you handle this, as many of the available information seems overly complex. Kind regards Paul and team! More on this as we go. This is fantastic stuff! I think this type of discussion in woodworking is often overlooked. Much is written about “how” to do things…sharpen, saw, plane, etc. Some is even written from a design stand-point…size,proportions, artistic view, but very little discusses the balance between the visual appeal and the “engineering” of a piece. 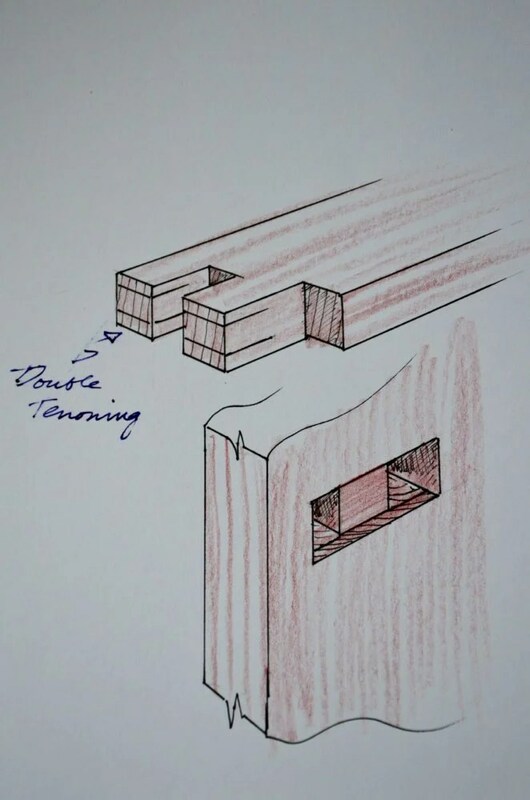 It’s so great to understand the pro and con of a specific joinery, why it works, how it works and what the alternatives are. 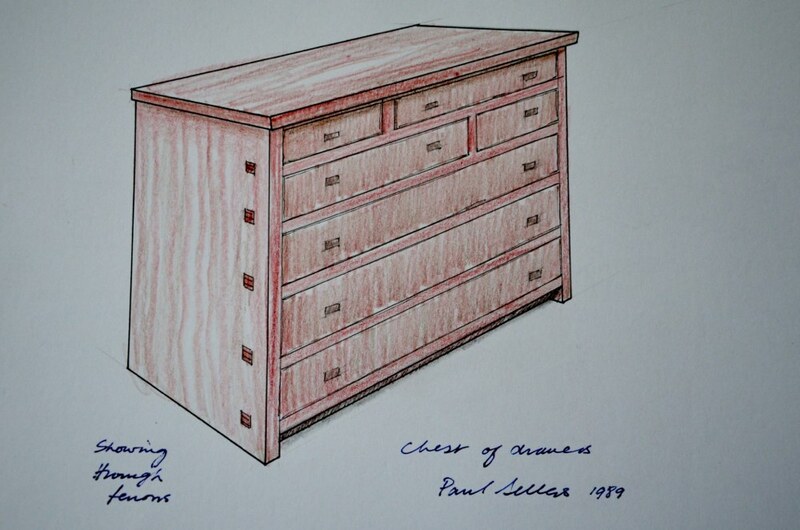 Sure you can build thousands of pieces of furniture by just using dovetails and regular mortise and tenons, but why let the fun stop their 🙂 Thank you Paul for sharing your thoughts and experience. This is why your blog is so rewarding . The glue that holds it all together- Paul Sellers. When I was at university we were asked to define Design. I found that very difficult in reducing it to a singular definition and ended up with a response of “Design is what you make of it”, which I believe the lecturer found to be to obscure, maybe not textbook enough. To develop and refine something is a great skill with many issues to be overcome. There is not one method which suits everybody as we all have our own parameters, self imposed and otherwise. One of the greatest insights into an overall perspective of a craftsman is having someone like yourself with the benefit of experience and time being generous enough to share your experiences and life. Not everyone has the capacity or the nature to give this gift.